Ten seconds left in the game. The score is tied at 72 apiece. Michigan defends and Kentucky looks to inbound the ball from the left side of the floor. UK guard Andrew Harrison collects the pass and begins to set up the play. 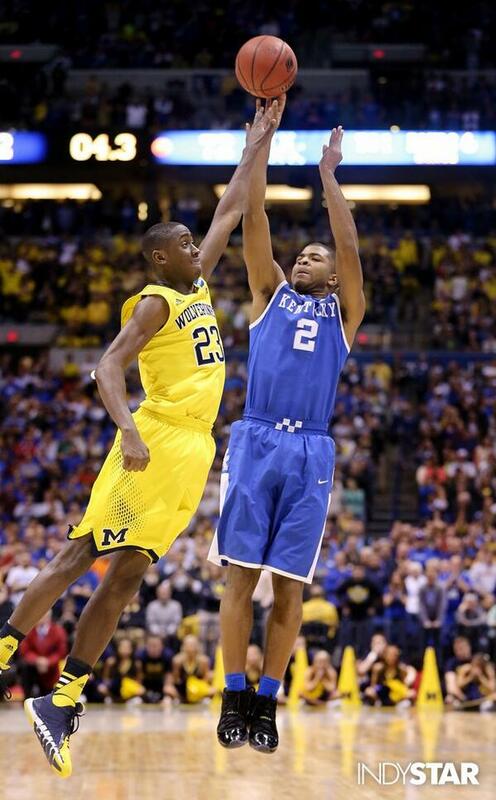 A few seconds pass before he dribbles the ball to his left, handing it off to his brother, Aaron Harrison. As the pass is made, Andrew sets a screen on Michigan’s Nik Stauskas, triggering a defensive switch with Michigan guard Caris LeVert. Harrison continues to dribble toward the top of the key as LeVert defends. Harrison abruptly changes pace and direction, stepping back and to his left where he will attempt a long three-point basket that would give Kentucky an almost insurmountable lead with only moments left to play. LeVert anticipates the step back move and leaps toward Harrison in an attempt to disrupt the shot and send the game to overtime. Harrison’s feet are set and he jumps, leaning back ever so slightly to create room for the shot. LeVert is also off his feet, stretching his body as far as it can reach, trying to block the shot, to break Harrison’s concentration, and above all – to not commit a foul. With only 4.3 seconds left on the clock, these two young men came together for a moment in time that would propel one into the national spotlight and the Final Four, while the other would suffer the heartbreak of a season ending too soon. That moment, shown below, was captured by a photographer from the Indianapolis Star. As the picture shows, LeVert missed the block. Harrison’s long range jumper found the bottom of the net. The shot proved to be the game-winner as Kentucky won the game 75-72. The Wildcats were jubilant; the Wolverines crestfallen. So many things are made clear in this photo. The determination of both players, the athletic abilities they possess, and the differences that come from a split second or a fraction on an inch. When I saw the shot live, I couldn’t appreciate what a difficult shot Harrison was attempting or just how close LeVert came to making a phenomenal defensive play. So many little things came together over the course of the game to allow for this singular moment to occur, and as the game ended players and fans of both teams were left to wonder what might have been. As is often the case in sports, the events on the field of play mirror the events of real life. Every day of our lives is filled with decisions of all shapes and sizes. Each of these individual decisions results in consequences which lead us to make more decisions. At times things go in our favor. Other times we find ourselves in a place we never imagined possible. And as the photo shows us – the difference between those two outcomes is often little more than a fingertip. In life, as in sports we experience these moments and are forced to move on to the next thing. At the end of the game, Michigan’s players moved on to consider what they could have done better and to begin the process of improving for next season. Kentucky could savor their victory for a time, but they too needed to move on in preparation for their next game in the tournament. God has created us to approach events in our lives in a similar way. We make a choice, experience the consequences and we move on. But here’s the critical point: what we learn from that event will help shape us to perform better in the future. Basketball players turn to their coaches and playbooks. Christians turn to the Father and His word! God calls us to seek out His wisdom and counsel so that we might overcome our sin and live lives that bring Him glory and honor. In victory or in defeat, seek out the will of God for your life. He is the source of true wisdom and through Him our ultimate victory over sin and death is secured. This entry was posted in Devotional and tagged A Fingertip Away, A Mile in My Schu's, Aaron Harrison, Andrew Harrison, Basketball, Bible, Blessings, Buzzer Beater, Caris LeVert, Choices, Christian Life, Christianity, College Basketball, Day 1 of 1, Devotion, Devotional, Devotionals, devotions, Elite Eight, Faith, Final Four, God, God's Plan, James 1:5, Kentucky Wildcats, Michigan Wolverines, NCAA Tournament, Nik Stauskas, Overcoming, Path of Life, Perseverance, Religion, Richard Schumacher, Wisdom. Bookmark the permalink.